These spectacular Victorian earrings feature a peacock tail figural top. Gold mesh chains finished in polished beads sway from the crown topped dangle. 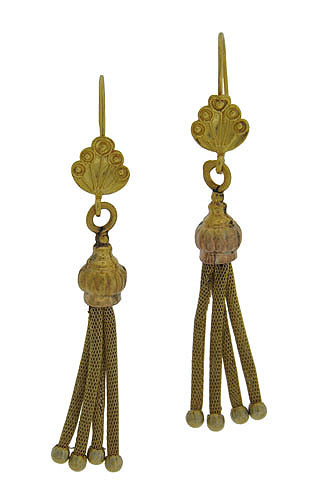 The antique earrings are crafted of 9K yellow gold and finished with wire backs. The earrings measure 2" in length, 1/4" wide. Circa: 1900.